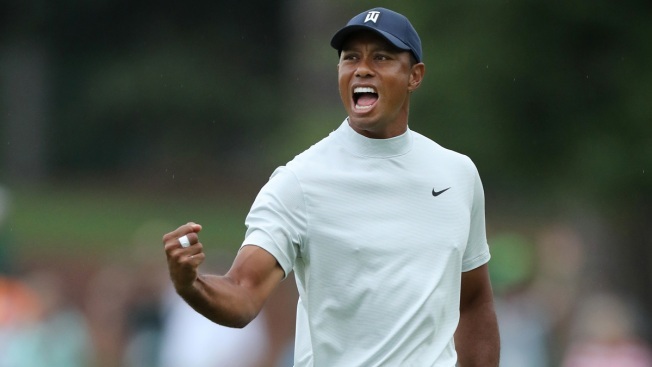 Tiger Woods of the United States celebrates after making a putt for birdie on the 15th green during the second round of the Masters at Augusta National Golf Club on April 12, 2019, in Augusta, Georgia. Then there's the man lurking one shot behind: four-time tournament winner Tiger Woods. Woods shot a 68 and has plenty of big-name company among the leaders, including 48-year-old Phil Mickelson, who didn't have his best round with a 73 on Friday, but is still just three shots off the lead. "There's nothing better than having a chance going into the weekend at the Masters," Mickelson said. "And that's what I want to focus on and I know that I'm playing well enough." Molinari is trying to win his second major in two years after winning the 2018 British Open. The Italian played a bogey-free round, finishing with a 67. Day also shot a 67. All of the five leaders are major champions and three have been No. 1 in the world. Woods is tied at 6-under for the tournament with Dustin Johnson, Xander Schauffele and Justin Harding, who is the only Masters newcomer in the group. Ian Poulter and Jon Rahm are at 5-under. Koepka and Bryson DeChambeau started Friday with a one-shot lead. The 28-year-old Koepka, a three-time major winner, made birdie on No. 18 to salvage a 71 and stay tied for the lead. DeChambeau faded with a 75. The list of contenders might be impressive, but nobody draws a crowd like Woods. It's been 11 years since he won his last major and had five surgeries since then, including four on his back and the other to rebuild his left knee. It's hard to believe considering the way he was playing on Friday. Now comes the weekend, and it certainly has the potential to be a classic Masters finish.